MUMBAI, India (CNN) -- More than a day after gunmen stormed ashore and attacked at least seven locations in Mumbai, killing 125 people, members of India's premier counterterrorist force early Friday were seeking to end standoffs at the two luxury hotels and Jewish center that were attacked late Wednesday. The operation followed after grenades had been tossed from inside the structure toward anyone approaching the building -- three such explosions occurred in four hours. A gunman was killed around 1 a.m. in the Oberoi hotel, where commandos were going room-to-room, trying to flush out attackers and rescue people, J.K. Dutt, the director of India's National Security Guard, told CNN-IBN, CNN's sister network in India. "I have whatsoever no information as to what's being done to rescue them," said the woman, who did not give her name to CNN. "There is somebody inside who is preventing the rescue," she said. "They should take action and let us know what is happening." But whoever planned the attacks spent months coordinating them, even setting up "control rooms" in the two hotels targeted, the Press Trust of India reported, citing Union Cabinet Minister Kapil Sibal. "Enormous planning went into the incident. The terrorists were dropped by a mother ship and traveled in rubber boats which they docked (at Mumbai)," Sibal said. The death toll from the series of coordinated attacks was at 125, by Friday morning, authorities said. Among the dead were at least six foreigners, three top law enforcement agents, including Hemant Karkare, the chief of the Mumbai police's anti-terror squad, and 14 police officers. Two women and a child were seen escaping from the building, said Johny Joseph, chief secretary of Maharashtra state. 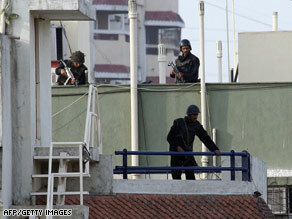 CNN-IBN reporter Raksha Shetty said three people escaped -- apparently a caretaker, a cook and a child. Israel's Haaretz newspaper reported later that Sandra Samuel -- a cook for the center who had barricaded herself in a room in the house -- told them she grabbed a toddler whom she identified as Holtzberg's son and fled the building, along with another person. "I just grabbed the baby and ran," Samuel told Haaretz. A standoff at a fourth location -- the Cama Hospital for women and infants -- appeared to have been resolved by Thursday morning, CNN-IBN reported. The Indian navy, stepping up patrols on the country's western coast after the attacks, boarded a cargo vessel Thursday afternoon, officials said. They and the Indian coast guard were also searching for a small boat in the Arabian Sea. Nine suspects were arrested in connection with the attacks, including seven fishermen. Police also found a boat loaded with explosives near the Taj's waterfront location. "We asked, 'Where are you coming from?' They said, 'Go do your work,'" another witness said. The gunmen then hijacked cars -- including a police van -- and broke up into at least three groups to carry out the attacks, police said. CNN's Andrew Stevens, Mallika Kapur, Phil O'Sullivan, Phillip Turner, Ravi Hiranand, Yasmin Wong and Harmeet Shah Singh contributed to this report.